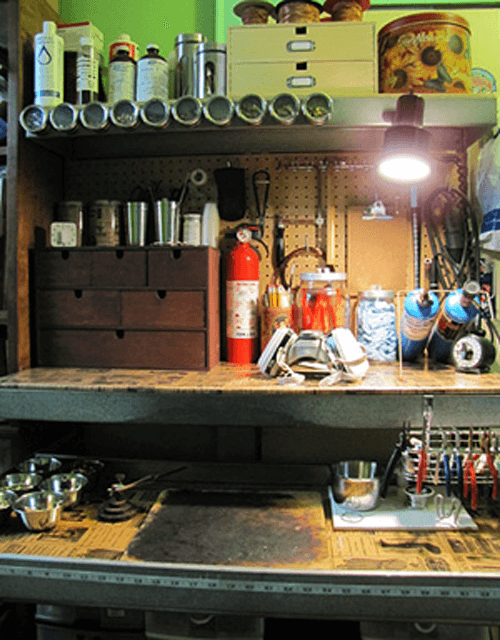 Your jewelry work bench is the centre of your creative space and will serve you as you grow and experiment with different materials and techniques. 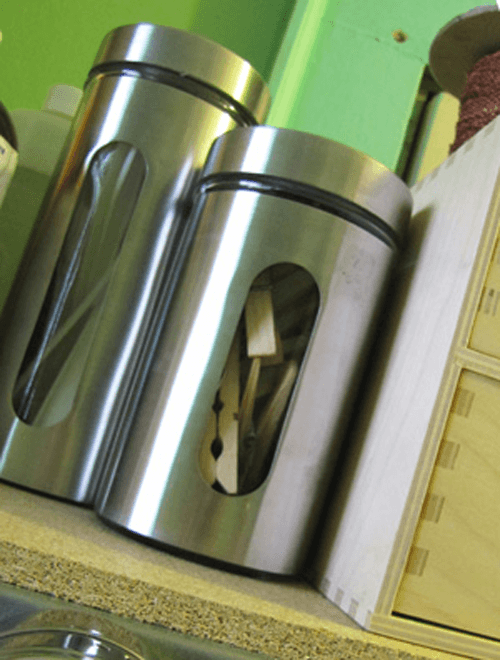 Therefore it is worth considering carefully what materials you will be using and how to set them up on your work area. I love that my table has a pull out work surface that extends over my lap. I use this surface for soldering, epoxy and resin work and for cementing. 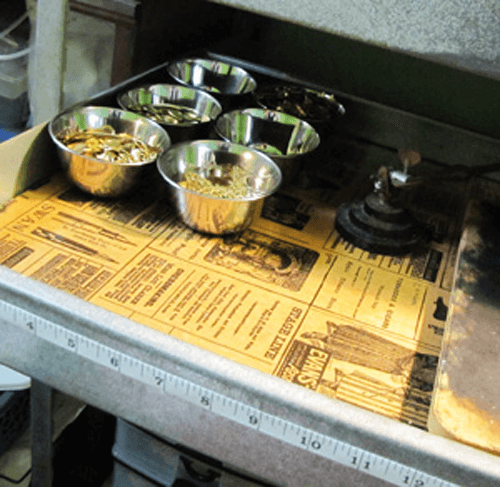 I keep a soldering board permanently on the table and simply put a cementing board over it when I need a surface that I can remove and set elsewhere to dry. My bench is totally utilitarian and serves me well in function. I will definitely purchase one of these for my new studio, but I will likely spray it first with a pretty Tremclad metal paint to make it visually to my liking. Another great function of the pull out work surface is that once it is out it extends the work area so that it does not interfere with my under storage space and leaves plenty of leg room. If you are interested in a unit similar to this you can find them at Lowe's. Here is one available at Lowe's in the U.S. and Canada. To date Lowe's has the most competitive price on this item. 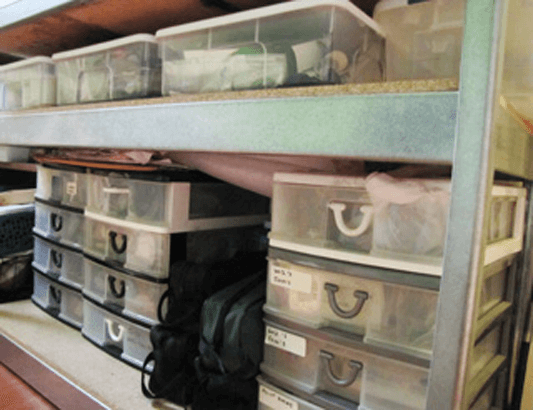 Some of my favorite places to shop for organizing containers are Ikea, the dollar store and China town. I purchased these great magnetic tins at the dollar store...and they really work! I was concerned that perhaps the weight of the product inside would be to much for the magnet, but they are great. Always test items that you get from the dollar store because, let's face it... some of those items are in the dollar store because they are not very good. Here is another great find from the dollar store. 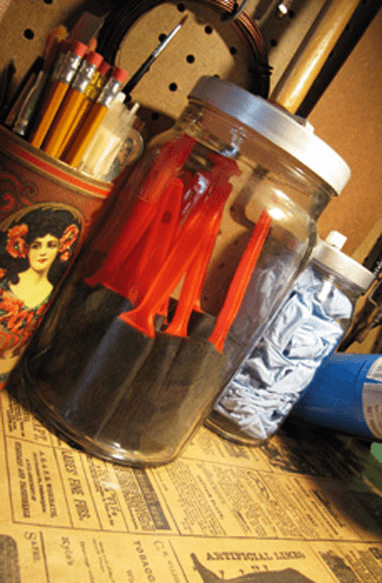 These glass and metal containers have a good seal and make perfect storage for items that need to be kept dust free and they also have a nice industrial feel. 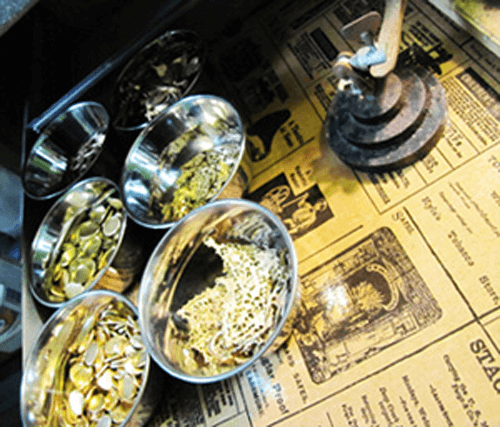 Recently I visited one of my favorite shops in Chinatown and found some great metal bowls for organizing the findings that I will be soldering. They would also be great for any beads or findings that you need as you are assembling jewelry. Especially so for items that you use a lot of on a regular basis. I also picked up this handy rack that can be used to store tools or any kind of materials you will likely reach for often. 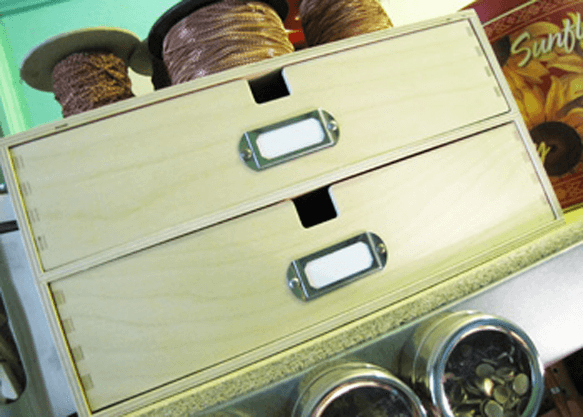 I am a fanatic about little drawers and I love this little two drawer organizer with the old fashioned label plate. I use this to store larger supplies such as barrette backs for soldering. These tall glass containers from Ikea are great both for the workbench and in the kitchen. They make great containers for items that need to be kept dust free or just about anything. I have one of them filled with the nitrile work gloves that I use often when working with chemicals. It is hard to believe that I spent so little for something so great. In the photo below you can see the peg board on the bench back. 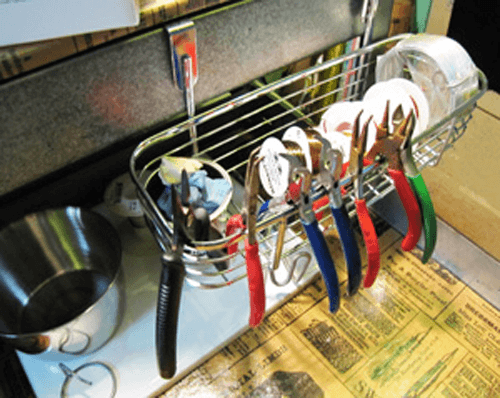 Peg board is a great invention and you can buy a variety of hardware items to rig up just about anything on it. Consider peg board for other areas of your studio. 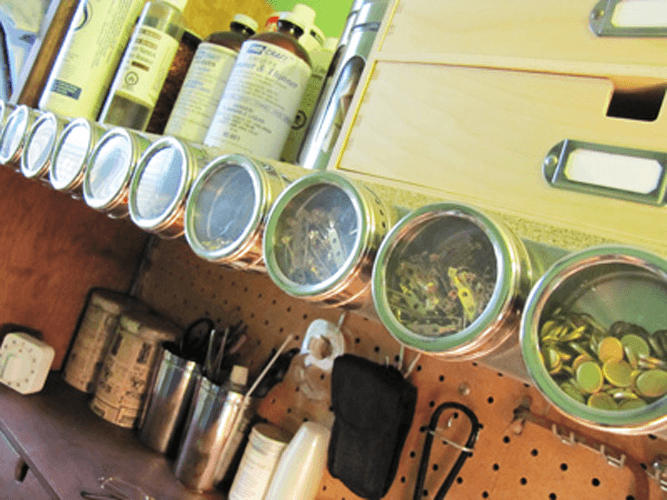 You can put mini shelves on them or rig up a dowel system for chains, wire, ribbons and cords. This would be handy on a wall right beside the working area. 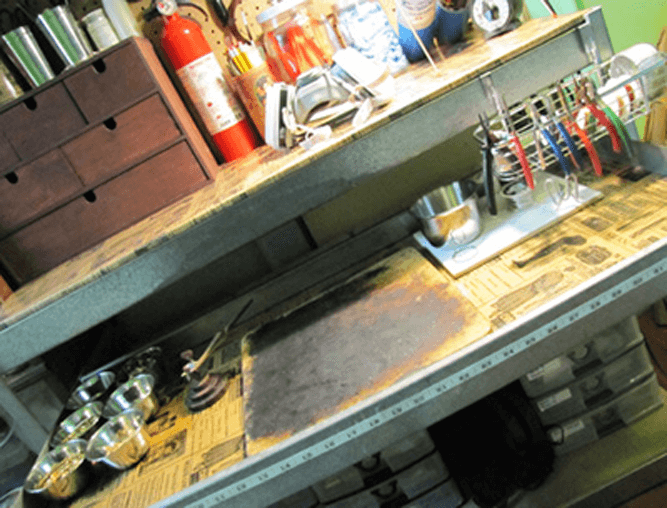 At the top of my work bench I keep my toxic chemicals such as epoxy, flux, lacquer, thinner and patinas. After I am finished soldering with my mini flux container I always return it to a high spot to keep it away from little hands! tape that you put somewhere "special"...if you know what I mean. Sign up for proven strategies for growing your jewelry business. Plus get a FREE 25 page guide on how to choose powerful business names, product names, & collection names names that will set you up for success!